Irvine, CA, December 1, 2009 – With a champagne toast and a pound of the hammer, Master of Ceremonies, “Gavel Goddess” and Screaming Eagle Estate Director Ursula Hermacinski kicked off the very first live auction from new auction house Spectrum Wine Auctions last weekend, held simultaneously at the St. Regis Monarch Beach in Dana Point, California and Crown Wine Cellars in Hong Kong. By the wee hours of the following morning (and well into the Hong Kong afternoon), 686 lots and $3,454,944 in fine and collectible wines had changed hands with 100% of lots sold. “We’re very pleased with our first live auction,” said Spectrum Wine Auctions CEO Greg Roberts. “Buyers and consignors alike responded very well to our pre-auction techniques of a single estimate for each lot and as well as our unique 360-degree photos of a number of the lots. Combined with the lovely settings of The Conservatory at Crown Wine Cellars in Hong Kong and the Grand Ballroom at the St. Regis Monarch Beach, all this translated to strong sales of both individual lots and overall.” Capacity crowds gathered in the two live auction venues, and telephone and online bidders from around the world joined in the action. In addition to wines bidders brought themselves, Spectrum sampled numerous wines during the auction, including a 1995 Chateau Lafite Rothschild; 1996 Chateau Latour; 1998 Chateau Haut Brion; 2003 Greg Martin Estate and a generous tasting from the Screaming Eagle founders’ newest venture, Jonata Winery. Full auction results for each lot are available from the Spectrum web site: www.spectrumwine.com. Spectrum will keep an archive of all the photos of the lots (including the unique 360-degree photos that represented 200 of the 686 lots) and prices realized on the site indefinitely. With the first live auction just completed, Spectrum is already turning its attention towards the future. They have scheduled their next live auction for two days over March 19 and 20 at the St. Regis Monarch Beach, with a simulcast to Crown Wine Cellars March 20 and 21. 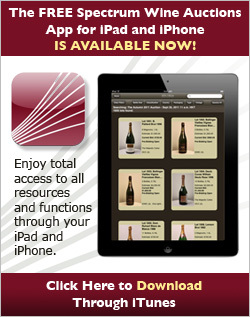 In the meantime, wine lovers can check out Spectrum’s online auctions; some will feature wines with $1 reserves. 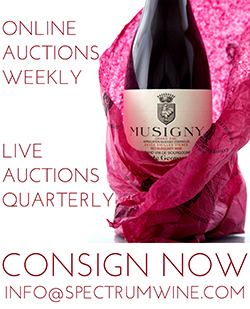 Spectrum Wine Auctions welcomes enquiries from consignors and collectors. Please contact Amanda Keston at 888.982.1982 for additional information and questions.